I never really thought much about poker. I was exposed to it as a child, but it seemed like there were too many rules. 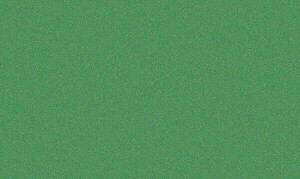 So the only card game that I would play at casinos was Blackjack, and I wasn't very good at it. The company that I work for had a Xmas party in 2004 and they held a Texas Hold'em tournament. A friend of mine won and was very excited about it. I had noticed that there was Texas Hold'em coverage on TV, so I began to watch out of curiosity. It seemed pretty simple, so I bought a few books and started reading. Of course the books were way over my head, since I didn't know poker at all. So I purchased a program, which would allow me to play against robots. I practiced and practiced until I felt that I was good enough to play against people (at least online). I signed up for Poker Stars and Full Tilt Poker. I was surprised at how poorly everyone played at both sites. People would constantly go all-in before the flop and would get called by several players. Obviously, they weren't taking it seriously, because it was play money, and they didn't want to learn. Kids! After figuring out how to get around these idiot players, I was able to build my chips up to over a million or two on both sites. I decided that it was time to play for cash. I mailed a $1000 check to Poker Stars and started playing. I built it up to $3000 rather quickly. It got knocked down to $1200, back up to $3000, then down to $800. At that point, I figured that my game needed help. I had heard ads on TV about the World Poker Tour's Boot Camp, where pros teach you how to play. I signed up for a tournament class at L.A.'s Commerce Casino. It was a great experience (see my blog for details). See the stats below for my tournaments since the class. 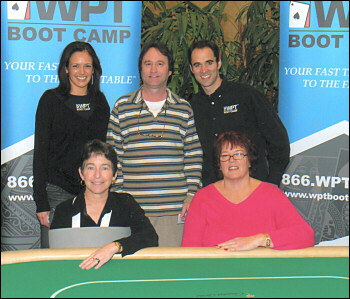 Linda "the First Lady of Poker" Johnson, Jan Fisher, Jules & Crispin Leyser - my instructors at the WPT Boot Camp (see photo above). I've seen Linda and Jan play several times in televised events, and I've seen Linda announce many WPT final tables. It was a great experience to learn from such seasoned pros. 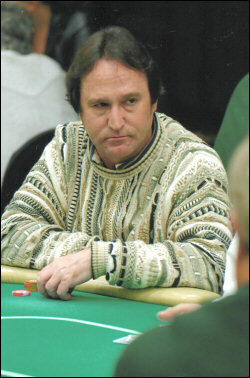 Bill Kontaratos - I met Bill during my WPT Boot Camp. He was a student, as well. However, I had seen him play a final table in a televised event recently. I believe that he placed second in that event.